Matt – Hi Amber! Thanks a lot for giving your time up for a chat today. First of all, do you mind letting us know a little about your setup? Amber – I envisioned the wild garden encompassing many things. So I grow and forage and wild-craft foraged plants and crops. I have half acre of land on the Just Food farm – a really interesting project run by a non-profit organisation called Just Food. They have a number of projects in the city, aiming to increase local food security, support local farming, and connect eaters and growers. 3 years ago they setup the Start Up Farm Program. They have land, equipment, resources and training to offer folks who want to get started in a farm business – for people who are new to farming, coming from non-agriculture backgrounds, wanting to give it a try before committing entirely, or without much prior knowledge. So I’m one of these farmers on the Just Foods Start up farm. I’ve got a half acre garden where I’m applying Permaculture design principles and I’m mostly growing medicinal herbs. The farm itself is 150 acres so I’m also foraging and wild crafting. All of the plants I gather I process and pack into wild food products and medicinal herbal remedies. This week I’m going to be making elderflower syrup and crab-apple butter and various herbal tinctures. I vend at different local events and markets, and I also work on monthly herbal boxes (which you can order through the website). Those are for folks who are interested in sourcing local, organic, handcrafted herbal remedies and wild food. Every month there’s a specific theme for each box – for example March’s box was on nervines so plants that are good for the nervous system, helping with stress, anxiety and stuff like that. These boxes are mailed out to subscribers on a monthly basis with a newsletter containing information on the products in the box – so background info on the plants, folklore, scientific research and how to make use of the products. So that’s one part of what I do, but there’s also the educational side of my work where I offer plant walks in the growing season, classes, workshops. I’m also really fortunate to be working with a number of home school groups, where I run kids programming. So for the past 2 years I’ve been running a herbal apprenticeship with a group of kids that come every Wednesday morning from May until November where I teach them botany, plant identification skills, we harvest cook and eat plants, make tea out of them, medicine, play a load of games, so I basically spend one morning a week hanging out with these amazing kids and playing with plants. It’s pretty awesome! Matt – That sounds great! I saw the herbal boxes on the site, they look really cool. Are most of your subscribers local? Amber – Yes they’re very local, in and around the Ottawa and Ontario area. I’ve shipped out West too but most of it is very nearby. I’ve even got a client based in Virginia in the US recently! Matt– Sounds like it’s working well! Do you feel you can expand on this to reach more people, or is it not such a scalable project? Amber– I would like to expand it a little bit. It’s fairly time consuming but I really enjoy the boxes – it’s an opportunity for me to get creative with the plants, I like coming up with the different themes and formulating different products. Something that’s important to me about the products that I have for sale is the direct to consumer link – so I don’t sell anything 3rd party or in shops. There’s a whole educational piece around it that would be missed otherwise – either informing them about the product by talking to them in person, at a market where I’m selling it, or though the newsletter. I really want to have that connection. To me bio-regional products are really important. There are other folks that are doing similar boxes (Community Supported Agriculture) where they’re purchasing their products from other suppliers and putting the boxes together, but to me it’s really important that any of the plants I’m using or selling have been grown or collected by myself in the Ottawa or Ontario region. I want to be able to communicate that as well, so these plants came from the ecosystems in which we inhabit. I don’t imagine scaling it up to be a huge commercial enterprise – I want to keep things fairly local and maintain that connection as much as possible. Matt – How would you describe a typical working day? Or does it vary so much? Amber – At the moment things are a little different because we’ve just become fosters to some puppies, so they’ve been keeping our hands full! Normally things are very seasonal, so right now there’s not much going on as it’s -26 degrees out there now and most things are still covered with snow. Winter tends to be a bit of a slower time for me – where I can rest, relax, read, study and plan for the season ahead. By around the end of April the nettles start popping up, with those other spring greens. 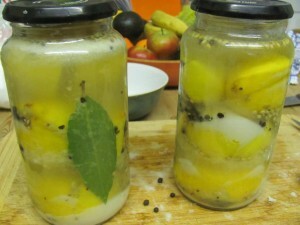 May is a very busy time where I’m foraging nearly every day and hand crafting, processing things, tincturing and so on. There’s always things to be done in the garden too! pain and swelling. One of the key principles of permaculture is to “stack” functions –so having elements that provide you with multiple functions. So the coppicing of the willow serves a number of functions for me – it helps control the excess water on my land, which is a problem here due to the heavy clay nature of our soil. When I coppice the willow back it encourages the roots to take up more water, so I get fencing material out of it, and I get a medicinal harvest from it. So from the time I start coppicing to the last roots that are pulled out of the ground in November is a super busy time for me! It’s not difficult to see why Amber loves her Wild Garden! Matt – What do you find most rewarding about the work you do, and your lifestyle? Is there anything particular? Amber – Oh that’s really tough! I guess the sense of relationship and intimacy I feel I’m developing with nature. Specifically, with my little particular ecosystems that I move through and live in every day. It’s something that… I came to all of this as an adult in my 30’s. I’ve always loved being in nature and being out in nature, but there’s something that really shifted when I started working with the plants for food and medicine that really deepened my connection which I never knew was possible. That’s been very joyful to me… it’s hard to explain, but the sense of knowing and awareness that say, the snow has melted so the maple is about to leaf out, so I know in that sense that the wild leeks will be appearing soon. 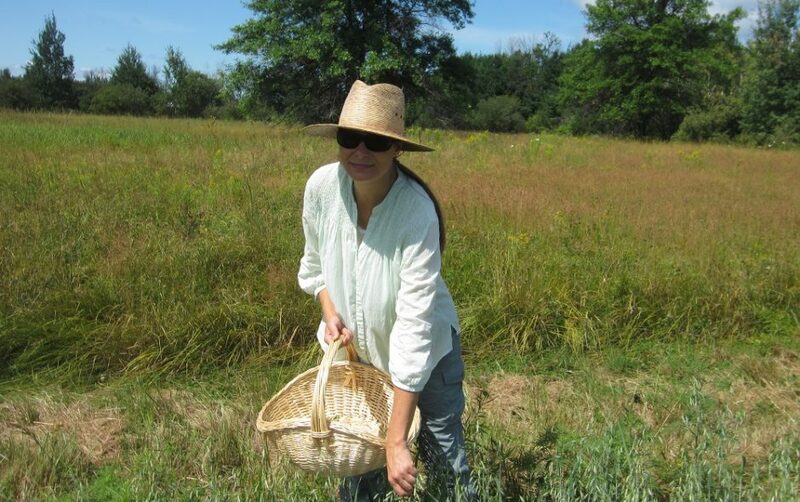 Just having that kind of intimacy and connection is really meaningful and… I really like the idea of foraging as stewardship, and the idea of tending to the wild – not being separate from nature, but being an important part of nature. It’s really exciting to think that we’re an important part of it. There are some conservationists that believe humans should be kept out of natural systems – to me that doesn’t make much sense at all. I get a lot more meaning and purpose out of the idea of tending to these wild spaces. Having a sense of balance, and entering into the system to interact in way that isn’t harmful but which has a beneficial effect. I’m still recognising that I’m nowhere near the stage that I can confidently say that I’m having a beneficial effect on a system… but the knowledge that I’m working towards this is really exciting. It makes me feel like humans have a really important place in natural systems and that’s exciting to me, and what I really strive for. Matt – What were you doing before you moved into this direction? Amber – I was an office manager in an alternative healthcare clinic – so I worked for a registered massage therapist, acupuncturist & chiropractor, so a typical 9-5 office job. It was a small building, climate controlled… I never knew what the weather was like unless I went outside! I really enjoyed my job, but in around 2008 things really started to shift for me – I was volunteering for a conservation organisation in town. I was learning about climate change, resource depletion and all sorts of other worrying things. The more I learned about how things were turning increasingly dire, the more the pieces seemed to fit together – knowing about consumption habits and so on. I decided I’d make a resolution to have an experimental year where I would not buy anything new for the whole year, so I’d reduce my consumption of goods, temporarily taking myself out of the system to give myself a break, and to look at things in a bit more depth. That was a really transformative and pivotal year for me, as I delved into these subjects a little more deeply. I went through a period of depression learning about the depths of the problems we’re in, but I soon realised that this sense of helplessness and hopelessness wasn’t much use to anyone. From there on I’d discovered things like permaculture, foraging and gardening. My response was to try to live my life by having as little environmental impact as possible – providing my own food needs and so on. From there I’d also looked at learning about wild foods as I was trying to eat as locally as possible. 7 years later it’s much easier to eat locally sourced food due to the explosion of local farmers markets and so on. The wild food part of this was a way of extending those shoulder seasons where there really isn’t a lot available. As soon as the snow melts the edible wild foods start appearing – they have a longer season which is great. 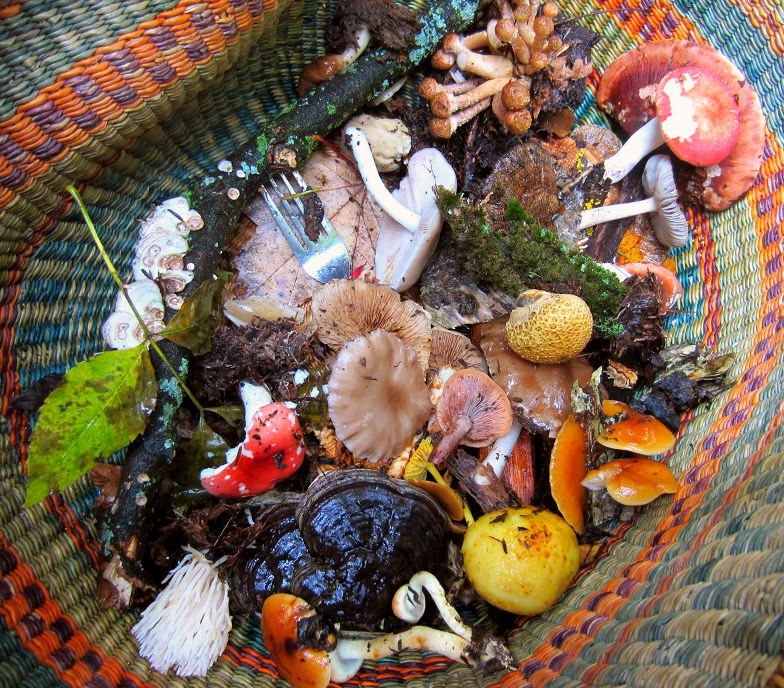 The wild foods were a way to extend my sources of local food. But then I realised how amazing this was – discovering there was Lambsquarters and Stinging Nettles at a nearby park that I could use to make dinner! From here there was a natural progression towards learning about medicinal benefits of plants and so on. I spent as much time as I could studying about wild foods and medicinal plants, trying new foods, and testing them out on friends! I was sitting in my office job on a beautiful July day, when I realised I was freezing inside due to the air conditioning being too high – so I decided to quit my job so I could start doing this full time! Matt – Are you able to be self-sufficient in terms of having your own fruits and vegetables, or is there still a fair amount you need to source locally too? Amber – At this point it’s only making up a fairly small percentage of my personal diet. Before I started the business I was able to incorporate more wild foods but now with the business it’s more of a balance of time. If I had to put a percentage on it, and it is very seasonal, but during the growing season perhaps 20% of my diet is wild food, dropping to 10% in winter. We moved house last year and were without a garden, but now we have one that’s ready to be setup and planted, so we should be much more self-sufficient this year. Essentially all of May and June I head out of the house, go for a walk and grab a few greens and that will be my meal. I might buy some local duck eggs to go with it. I love it when my partner calls me and asks what I’m up to, and I tell him I’m going for a walk to get dinner! We’re also very lucky as we have some local growers who love supplying us with local vegetables.  Matt – Do you have any favourite wild foods or plants? Amber – Stinging Nettles top the list for me – they’re so nutritious and abundant. From a permaculture perspective they’re fabulous as they serve so many functions – you can use them as a compost, they can be steeped in water then fed to plants, I like to dry it and drink it as a tea, they’re delicious in a soup or fried like spinach, powdering and adding to foods – they’re a favourite. Winter cress is another one. I’m really looking forward to that this year – it’s from the mustard family and comes up in early spring. The flowering buds look like little heads of broccoli. It’s similar to Rapini and is one of my favourite foods – just snap off the tops whilst young and tender, then cook. They’re one of the earliest in the year and they’re always a favourite. Elderberries and elderflowers are another favourite of mine, especially because of the nutritional benefits they have. Matt – Stinging nettles are abundant here in the UK, you’d probably love it here! Amber – I’m so jealous of the UK, especially those wild hedgerows you have over there! We don’t really have anything similar to that apart from just natural hedgerows that might pop up along fence lines or hydro cuts. We actually have a wood nettle called Laportea canadensis that tastes even more delicious than stinging nettles. It’s not nearly as abundant as stinging nettles, but the taste is great – and I think that’s something that’s more common over here in Canada than compared to the UK! Matt – Obviously you know a lot about this topic, is it pretty much all self-taught? If you started just a few years ago you’ve definitely learned a lot! Amber – In 2008 I started courses run by a lovely lady, a botanist named Martha Webber. 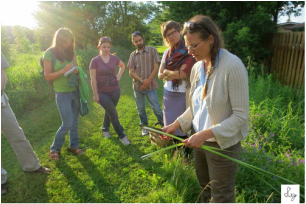 She’s been teaching these wild edible courses every spring, longer than I’ve been alive. I signed up to her classes and learned a lot from her, that was a wonderful experience. Whilst on this course a fellow participant told me of a herbal apprenticeship course nearby, which was a weekend course that lasted a year. Apart from this most of this has been self-taught – tons of reading books and researching online. I also try to get to a herb conference every year, where we study and take classes with other teachers. There’s tons of fantastic courses online on herbal courses and long distance courses which I’ve also been enrolled in. Matt – Do you have any favourite books on wild foods & plants? Amber – There was one book published in the UK under the title Hedgerow Medicine (Julie Bruton-Seal & Matthew Seal), in Canada it’s called Backyard Medicine. I love that book a lot. Nature’s Garden and Foragers Harvest by Samuel Thayer are excellent too. I really like the work of Arthur Haines, he’s in Maine. He has 2 books on ancestral plants, and those are fantastic. He’s an incredible resource and he also admins a great Facebook group on the topic. For foraging books those are some of my favourites that I access all the time! Matt – How do you feel about the attitude towards permaculture in the USA and Canada? Here in the UK there seems to have been quite a big movement towards this in the past few years as more and more people are getting involved in this way of living, how do you feel about it where you’re based? Amber – Yeah – actually sometimes it feels like I exist in a bit of a bubble! A lot of my friends and connections are interested in permaculture too, but I do think that there’s a growing interest. I see more and more people expressing a desire to learn more, or they’re curious about permaculture, and how to apply it. The Permaculture Institute of Eastern Ontario, near where I’m based, that started a few years ago and they’re the folks I did my PDC with. They’re very active in the area trying to introduce more people to Permaculture and running training courses. There’s been a bit of a permaculture convergence in the North East, both in Canada and the US, towards Quebec, so it’s been really interesting seeing that growing and the development of those communities, especially with relation to those in the United States. Matt – Do you feel that enough is being done to support and encourage people to work in the kind of area that you’re in? Amber – I think there’s a lot of progress being made; we’ve definitely come a long way. Particularly in the Ottawa area there’s a lot of good work that has been done – helping with land access and so on. I think there are some changes being made to zoning regulations that allow produce to be sold from community gardens, so there are a lot of positive changes being made which is really encouraging. There are some barriers in the way still – you hear about large multinational organisations buying up large areas of land. For example there’s a nearby fruit canning plant that’s being shut down, with work being moved to a cheaper location. I like to focus on the positive elements, and there’s a lot of folks doing good work in this field. Matt – What, if anything, would you advise to somebody living in a more urban area without access to land? Is there anything you’d suggest to help them get involved in growing foods, or foraging? Amber – I mean I can only speak from my experience of being in Ottawa. In this city we’re relatively unique – we’re a small city but surrounded by a large green belt. We have access to space and land, and there’s a fair bit of green space within an urban environment. We also have a strong community garden and allotment program, so if you’re really keen on working the land and growing it’s not so difficult to get involved. In terms of foraging you have to be careful of bylaws but from my perspective if you take a plant like garlic mustard which is invasive, it’s hard to imagine the authorities fining somebody for collecting it from a local park. Back in 2007/2008 the city instigated a pesticide ban which was great news. So perhaps if you can’t get access to your own land you only need to be able to identify a few major species and then you can head to your local park instead – where you can get wood sorrel, stinging nettles, mustard garlic and so on. The wild foods you find are so much more nutritious for you too – more so than organic. They’ve had to develop their own defence systems so they’re a lot more beneficial to your health than eating cultivated foods, so they’re so much more beneficial to your diet. Matt – What are the laws & regulations like regarding collecting wild foods in Canada? 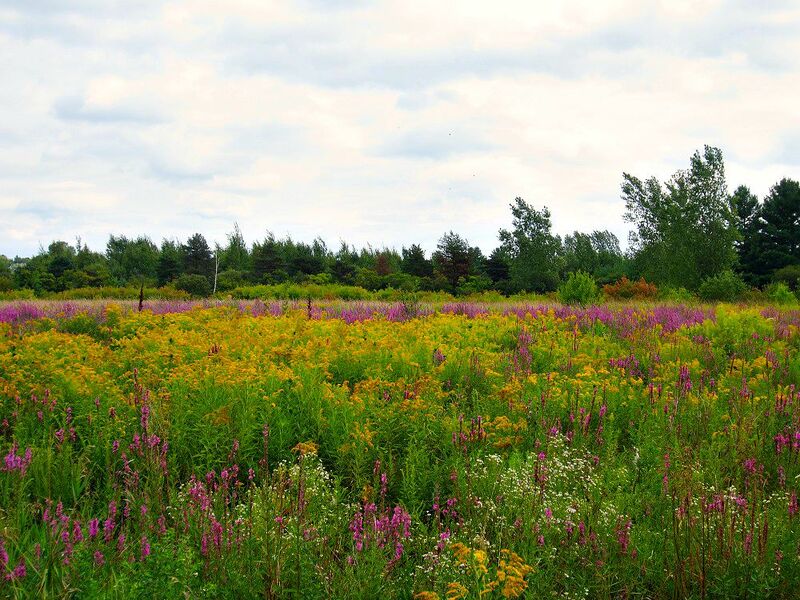 Amber – We have bylaws and regulations in place to protect plants from special areas. regulations aren’t so relevant, but there definitely needs to be ethics taught about the picking and collecting of wild foods. I spend a lot of time teaching my students about this and about our responsibilities to the plants and the ecosystems that we find ourselves in. For things like dandelions and garlic mustard perhaps it’s not so important, but when it comes to wild leeks and other less abundant species it’s a big concern. In the states you hear about people taking bodyguards into the woods with them – because there’s stories of gangs that will come and beat you up for your mushroom haul! So there’s a bit of a concern about that here at the moment (laughs!). Matt – Out of interest do you do anything in the area of mushroom cultivation, as that’s quite a popular topic from a permaculture perspective. Amber – I’m really interested in mushrooms and this is something that I don’t know that much about, but I’m still learning. With mushrooms you need to be really careful about picking wild ones – I like to go out collecting the chanterelles, oysters, ceps, and so on. I like to go out picking medicinal mushrooms too, but this is something I’m learning more about. My partner is actually growing oyster mushrooms indoors, so we eat those through winter. My dad also has shiitake mushrooms that he grows on logs outdoors, and I’ve got some Reishi blocks that I’m growing too. I’m learning more about mushrooms at the moment – I had the pleasure of listening to Paul Stamets talk at a mushroom conference recently that was really interesting. Matt – Thanks a lot for your time Amber, this has been a really insightful talk, and I really appreciate you giving up your time like this! To anyone interested in learning more about Amber and her Wild Garden you can find her website here. Don’t forget to take a look at her very popular (and often sold out!) monthly herbal boxes!